A squall can come up quickly here. 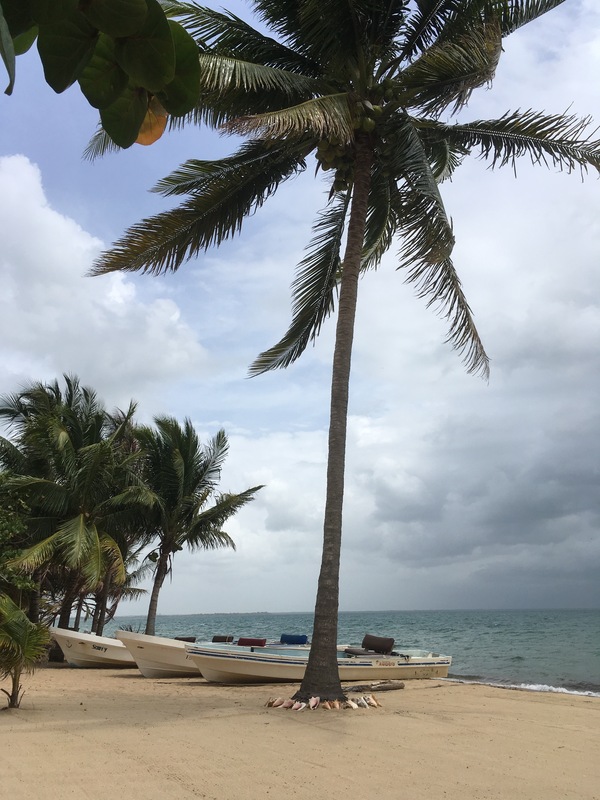 We are right on the sea, no Caye to stop the Bay from blowing and causing things to swing and wind to sing through palm fronds across the sandy long lawns. a squall blows in across Hopkins Bay. I rode my bike (rented) for miles down a bumpy dirt road with saw grass and palms trees higher than my head on either side, way down along a swampy bog. I’m told there is a chance I could see Raccoons if I go out along the Swamp’s edge just around dusk. I have yet to see a single Tarantuala or Snake but I have seen a nest of Baby Birds and lots of lizards. I swam in the sea twice and walked and ran down the thin strip of sandy beach, on which I was the only Human in sight. Around noon the breeze kicked up again and cooled things off. It was warmer at 4:00am than it is now, because the breeze had completely stopped. I rode from one end of the village to the next past oppulent constructions and fallen down shacks. It’s mostly closed up here at this time of here, there are a few other Tourists, riding Golf Carts, sending up clouds of dust as they zip down the dirty highway, packed in there, six or seven of them, coming to see what’s going down in the non-all-inclusive part of town. Coconut Gravy seasoned with herbs and fish. 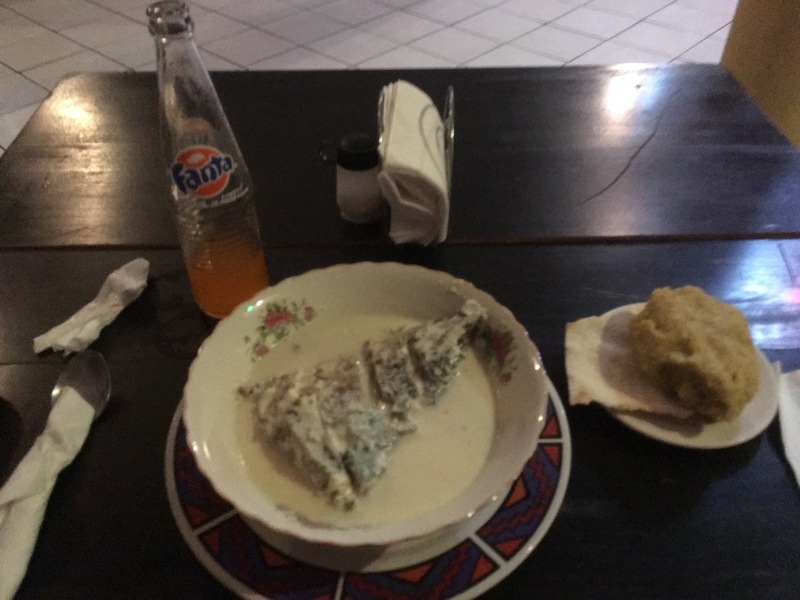 I ate the Hudutu last night at Innie’s Restaurant, it’s the second night I’ve eaten there, the first night I had StewChicken With Rice&beans, I also had their last Sprite on Tuesday, so last night I had Fanta Orange soda (which tastes like fake orange popcicle flavor). Hudutu has a thick chunk of bony fish inside of coconut gravy, I mixed it all up and made quite a mess, it ends up a lot like coconut chowder, although it starts out like a Chicken and Dumplings, if the chicken were an unknown fish and the dumplings were a clump of Plantain mash molded into a wad of doughy delight. The restaurant’s menu has this description of Hudutu: “Hudutu is mash Plaintains (in a cake) and gravy made from coconut milk, seasoned with local herbs and fish. This unique Garifuna dish has been cooked by the Garifuna People and it is loved by many people from all walks of life [who] have tried the Hudutu and many have loved… It’s definitely worth trying” – Innie’s Restaurant. I recommend You try it, too and getYourself some local Culture. What will you eat tonight? I’m not sure, I’ll see what they’ve. The man who is the hoat here brougt me half a freah watermelon, so it’s just like home.